These TRX training exercises will open your eyes to a whole new world of how to strength train! When looking at your main upper body muscles involved in the golf swing, the key areas that you want to target with a golf fitness program are the pecs, triceps, rotator cuff, and mid back to name a few. These muscles are all very active through the downswing, and increasing not only your strength, but your power in these fibers will help translate to a more forceful golf swing. A more forceful golf swing will lead to longer shots! The great thing about the TRX is that you can perform all three of the important phases for strength training for golfers very easily. Those three phases are stabilization, strengthening, and power development. Stabilization exercises are more general in nature, using multiple muscle groups at once, will lower resistance and higher reps. 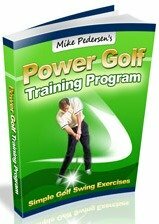 This type of exercises is typically performed first in the progression of a golf fitness program because it prepares your body for the upcoming, more strenuous phases. Pure strengthening exercises focus primarily on one prime mover and are traditionally the next phase. Once you have gone through both the stabilization and strengthening phases do you get to the power development. These exercises are high intensity, high velocity motions and can be specific to a sport or activity. This page will provide you with some general upper body TRX exercises to consider adding to your fitness program. -Stand Facing away from the TRX, with it suspended overhead and behind you. -Grasp the handles with each hand, bend forward, and move your legs back so that you assume a traditional push up position. -Perform a push up focusing on maintaining your stability! -Another variation of the push up would be to put both of your feet into the TRX and then perform the exercise with your hands on the ground in the traditional position. -Grasp the handles and lean back, so that you are hanging by the handles with your body in a slightly inclined position. Your chest should be facing the TRX attachment point, and legs should be straight. -Relax so that your body weight forces your arms to straighten. This is your starting position. -Pull your chest towards the handles using your arms, making sure that your are bending your elbows throughout and squeezing your shoulder blades together at the top. -Grasp the handles (with thumbs pointing up) and lean back so that your arms straighten. You should be facing the attachment point. -Keeping your elbows locked, pull yourself up with your shoulders so that your arms are making a "Y" at the top of the motion. Also, make sure that your thumbs are pointing behind you at the peak of the "Y". -Same starting position as above. -Begin with your hands touching each other directly in front of you, and then move them horizontally out to the sides, pulling your chest up and forward. Once in the "T" position, the back of your hands should be facing behind you. -Grasp the handles and face away from the attachment point. -Move one leg forward so that you are in a semi-lunge position. -First, straighten your arms and put them directly out in front of you. Then, with your palms facing forward, bend your elbows which shifts your body weight forward. -Now try to straighten your elbows using your triceps, working against your body weight.